HISTORY: Next to nothing is known about the Delubric Consortium. They represent one of several temporal agencies competing for power and control of the realm of known time (including past, present, future, and divergent timelines, presumably within the Multiverse). The few glimpses into their reality show them as Ditko-esque non-humanoids dwelling within an alien environment. (FF Annual#27-BTS) - The Delubric Consortium is mentioned as one of the competitors of the Time Variance Authority. (Avengers Forever#9(fb)) - In an effort to consolidate his power and prevent his competitors from interfering with his plans, Kang the Conqueror set several of the temporal agencies against each other. 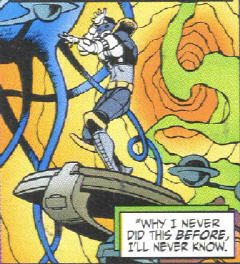 Kang manipulated the Delubric Consortium against Revelation. COMMENTS: Mentioned by Mark Gruenwald, given form and action by Kurt Busiek, Roger Stern, and Carlos Pacheco. Looking at the temporal map from Avengers: Terminatrix Objective#3, page 18 (as seen at the bottom of the Congress of Realities profile), you will see that the domain in the upper right corner (colored pink) is unlabeled. One might speculate that that is the domain of the Delubric Consortium, as they are the only known realm/group not seen in that diagram. At the time that story was published (November, 1993), the Delubric Consortium had not yet been mentioned. any other conglomerates or temporal agencies.